At ChezTECH it is harvest season and there are paper bags of tomatoes and zucchini and cucumbers standing all over the kitchen floor. Knitting at this time of year has its own distractions, chief among which at this point are fruit flies. So, before any knitting could happen today, the fruit flies HAD to go. Here's how it happened: All the overripe tomatoes were rounded up and put in the outside compost. Then, one last overripe tomato was put into the garbage and the lid left open. One hour later the trash was swarming. The last step was quickly closing the trash, taking it outside and letting the little pests fly away. Success! Now that the fruit flies have returned to their natural habitat, we resume with our regular knitting content. Starting glove fingers, straps, belts cords and other tiny knitted tubes often makes knitters crazy. And once you DO get them started, these tiny tubes aren't all that easy to knit, either. But from now on, these troubles will be behind you. Today we'll look at a neat trick to start tiny tubes and, once started, to knit them with good tension and no needle trouble. 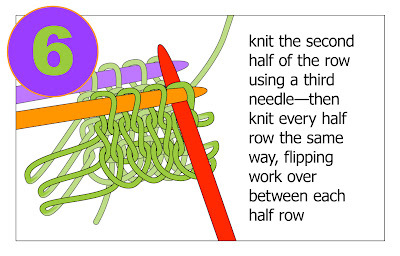 This method depends on two tricks: First, a waste yarn cast-on, and second, double pointed needles (dpn's) used in a bit of a tricky way--only 3 needles are used rather than the usual 4 or 5, with the result that the tubes are knitted flat and the needles don't fall out. 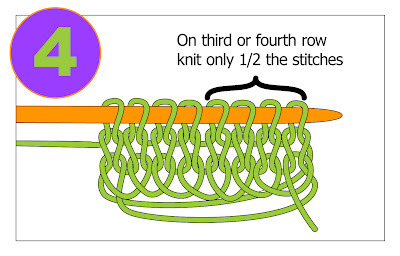 Step 1: Using waste yarn (illustrated in green) and a dpn of the size you will use to knit the tube, cast on the desired number of stitches, in illustration 1, below, eight stitches were cast on. 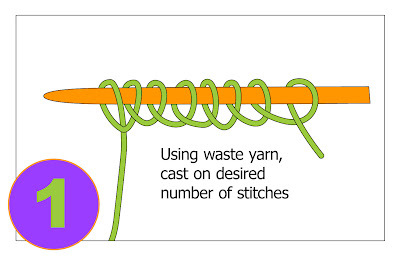 The illustration shows a back loop cast on, but you can use any cast on you like: the waste yarn will be completely removed, so the cast on makes absolutely no difference. Step 4: After you've knitted several rows in this I-cord fashion, then on the next row, knit only HALF the stitches. 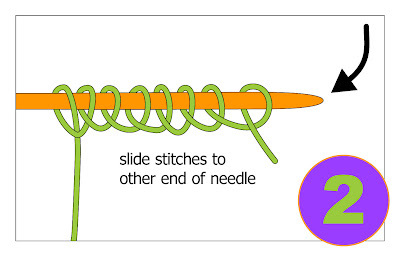 Step 5: In illustration 5, below, half the stitches have been knit off the yellow needle onto the purple needle. 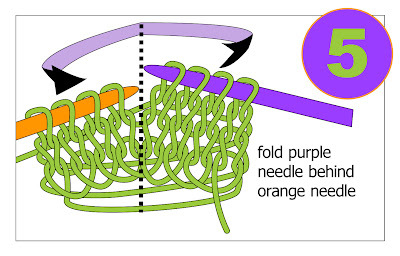 The next step is to FOLD the purple needle BEHIND the yellow needle, as illustrated by the fish-tailed arrow. Step 6: Using a third (red) dpn, knit the stitches off the front (yellow) needle. The back (purple) needle will be acting as a holder--you won't need to hold onto it as you knit with the yellow needle and the red needle, because the loops of knitting which are around that back purple needle will hold that needle in the work, and this is especially true if you use a "grabby" dpn, such as one made of bamboo. Once you have knit the remaining stitches off the front yellow needle, flip the work and continue in the same manner, using a third needle to work the stitches off the front needle, while allowing the back needle to act as a holder for the other half of the stitches. Step 7: After working an additional few rows (each row is 1/2 a round), you will see that the loopy mess of the original I-cord-type rows are at the bottom of the work, and that the tension is improving. Work as many rows as you feel you need to to get the tension under control, and the work firmly settled. 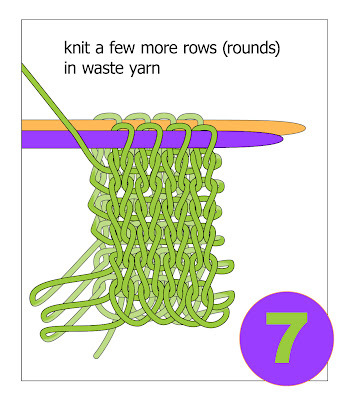 Of course, as you become more experienced in this trick, you will need fewer and fewer rounds of waste yarn, but for a first attempt, 6 or 8 or even 10 rounds are not too many. Step 8: Now it is time to switch from waste yarn to garment yarn. To accomplish this, you simply drop the waste yarn and start knitting in garment yarn. Two quick tips about this process: First, yes, there be big loop and some loose messy stitches right where the two yarns change, but these are easily tamed when the time comes for removing the waste yarn. 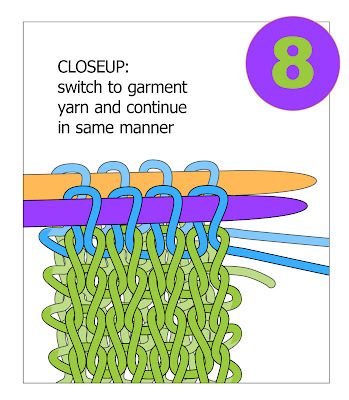 If it bothers you, you can LOOSELY knot the two yarns together, remembering to unknot them before you perform step 9. Second, leave enough of a tail of the newly attached garment yarn to finish the work off--preview step 9 for details. Once the waste yarn has been dropped and the garment yarn started, you simply knit the garment yarn in the same manner as for step 7. 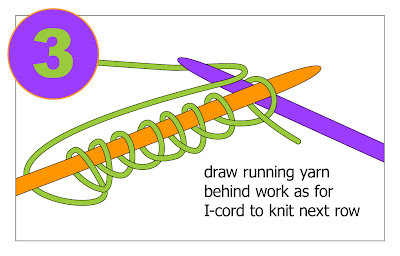 Again, as shown in illustration 8, below, you are knitting a flat tube, half a round at a time, using dpn's. Step 9: After you have worked at least a few rounds in garment yarn, you can remove the waste yarn, or you can choose to wait until the end of the project to remove the waste yarn. To remove the waste yarn, the easiest way is to pick it out, stitch by stitch, from the garment end--there is a loose end right where the waste yarn ends. Alternatively, you can simply cut the waste yarn tube with a scissors, making sure to leave 2 rounds intact, and then pick out these last two rounds carefully. How you treat the newly revealed loops of the garment stitches as each pops loose of the waste yarn depends on how you want the end of your tiny tube to look. 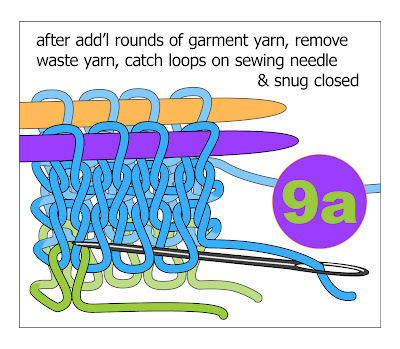 If you simply want to snug the end of the tube up into a tiny rosette of stitches, then follow illustration 9a, below. A blunt-tipped (tapestry) needle has been threaded with the tail of the garment yarn (and this is why you were clever and left the tail somewhat long back in step 8). As each stitch-loop of garment yarn (blue) pops loose of the waste yarn (green) it is caught onto the sewing needle. After each garment stitch-loop has been caught as per the illustration, the needle is passed through the first stitch-loop (and only the first stitch-loop) again to prevent a gap from forming. The yarn is then drawn up s-l-o-w-l-y (this prevents knotting) until all the stitches are snugged up into a center rosette of stitches and the tube is thus closed. 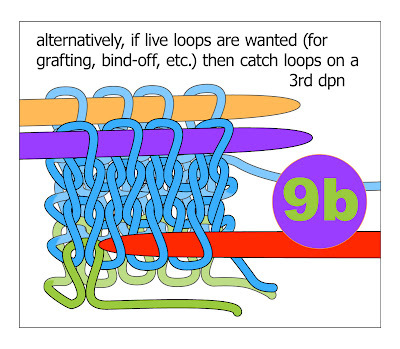 If, however, you want to keep the stitch-loops of garment yarn live, the follow illustration 9b, below. As each stitch-loop of garment yarn pops loose of the waste yarn, it is caught on a double-pointed needle. An example of where a dpn pick-up might be appropriate is when you might want to Kitchener stitch the end of glove fingers together--the Kitchener stitch makes a smoother, flatter finger-end than the little knot you'd get with the drawn rosette of stitches resulting from step 9a. Another example of where a dpn pick-up might be appropriate is when you want a square end to a belt or strap you might make by this method.To get a square end, you'd cast OFF these live stitches, and this is why you left a long tail when you attached the garment yarn back in step 8. One thing to remember is that when you work DOWN from a cast on edge, you have one less stitch than you were expecting (click here for an explanation) so you either have to fudge OR cast on an extra stitch at the outset to avoid this problem. 1. If you making glove fingers, consider making the very ends of the fingertips on a needle one size smaller than for the rest of the glove finger/glove body. This will make for a better fit and denser material right where you need it--on your COLD fingertips. 2. Use waste yarn of the same weight as, or thinner than, the garment yarn. If you use thicker yarn, your first row of garment stitches will be larger than the others, and that will make it difficult to have a nice finished product. The very next post about "belly buttons" expand on this trick. It shows how to use a tiny tube of waste yarn as the start for a center-out item, such as a hat or a center-started blanket--click here to go to that post. You have been reading TECHknitting on: knitting tiny tubes: glove fingers, straps and belts. Some ideas just make you say "WOW"